Epic Games has previewed some of the new features coming up in Unreal Engine 4.20 during its keynote at GDC 2018, including new level streaming, replication and level of detail options. The functionality was developed during work porting Epic’s own massively popular Fortnite Battle Royale – the replay system for which will also feature in Unreal Engine 4.20 – to mobile platforms. In the keynote, Unreal Engine lead Nick Penwarden rapidly runs through the new functionality, which is mainly centred around optimising the engine to maintain a steady frame rate on lower-power hardware. The changes are all summarised in the handy slide above: if you want to see it larger, it pops up on screen at 09:00 in the video at the top of the story. Unreal Engine 4.20 will also make Fortnite’s upcoming replay system avaialable to all engine users. The system, shown in the video above and aimed at YouTubers and Twitch streamers, enables players to replay gameplay clips from a range of camera angles, and adjust playback speed and post effects. The new features listed in the GDC 2018 keynote will become available on Epic Games’ GitHub repository in April. 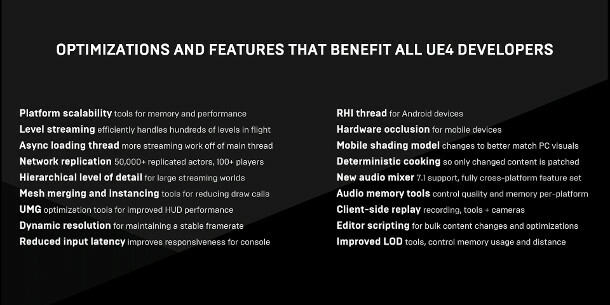 Unreal Engine 4.20 is due to ship later this summer. The current release, Unreal Engine 4.19, is available for 64-bit Windows 7+, macOS 10.12.6+ or Linux. Epic takes 5% of gross beyond the first $3,000 per quarter for any UE4 product you release commercially.